WYRM’s Gauntlet has worked with me before to launch their first site back in 2013. 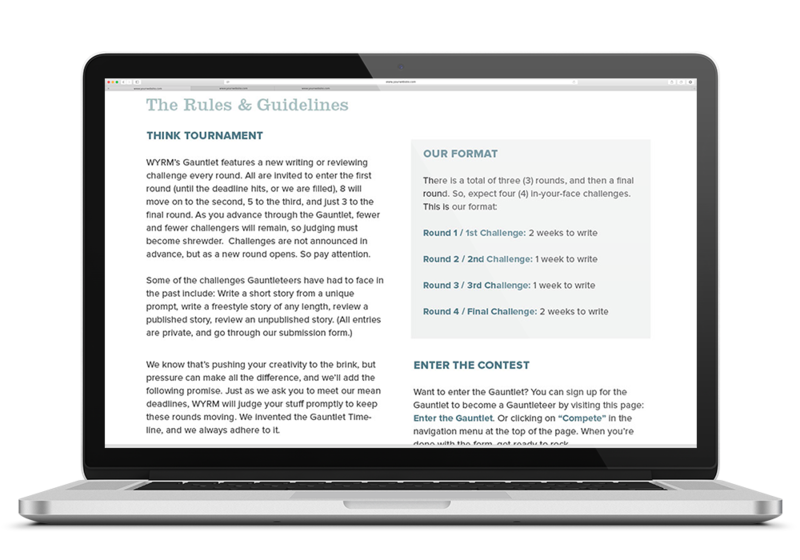 The Gauntlet is an annually held, independently-run writer’s competition that focuses on speculative fiction. Speculative fiction being described as a genre of writing that focuses on the supernatural, fantasy and science fiction. The contest’s original site from 2013 was not responsive which was restricting it from being viewable on as many difference devices as possible. There was also some reorganization that needed to occur to help contest entrants navigate the site in a more concise manner. This would allow entrants to focus on writing and reviewing great work while enjoying a simple and streamlined website experience. As with most writing websites, typography commanded the most attention as WYRM’s Gauntlet wasn’t image focused. We went with two subtle images on the homepage, both very abstract, and depended primarily on strong type to organize and carry the content for the rest of the pages. 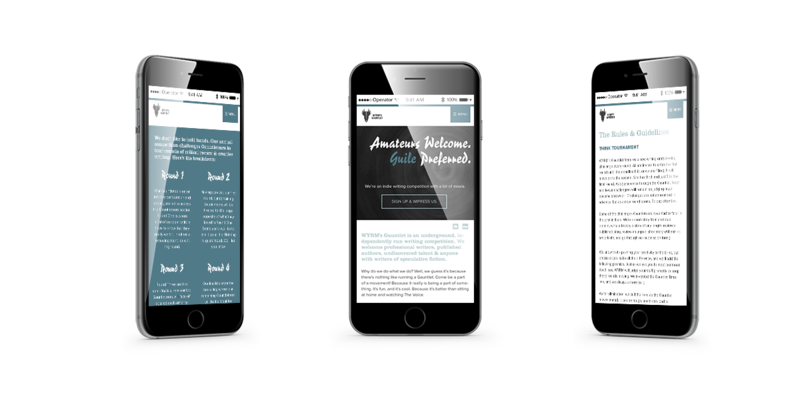 For the site’s structure, little changed aside from the addition of a responsive framework to allow the site to be responsive and a visual editor so the runners of the competition can easily update the site themselves. The initial colors were red and black and I felt like taking the site in a fresher direction with the colors would help give the design a more professional, but still approachable look. The blues are purposefully chosen to be a little on the subdued side to avoid the dreaded, “corporate blue” look. The layout focused on a simple two-column approach to channel a literary magazine type of style. In addition to the refreshed look, the entire website is responsive and looks great on a tablet, phone or desktop. 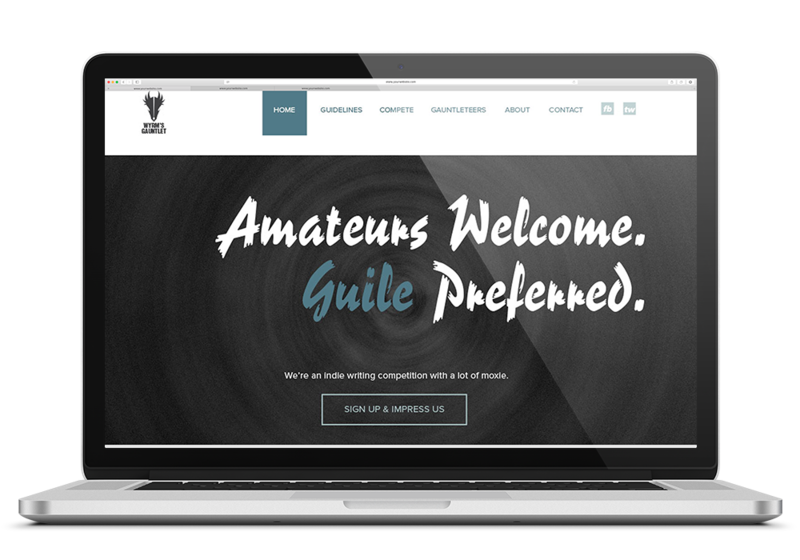 The Gauntlet needed to stand out from its competition, which were other literary competitions–many of which have very outdated and often confusing websites. 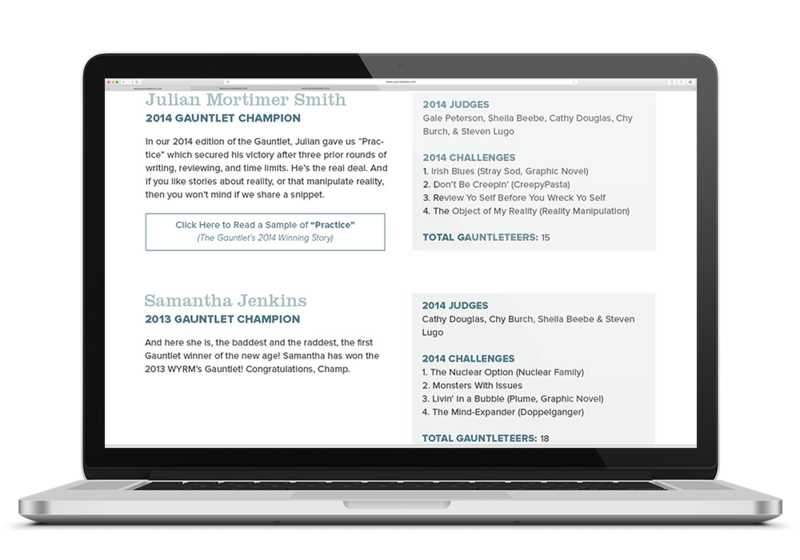 The website for WYRM’s Gauntlet is live as of July 10, 2015. It features a visual composer for easy maintenance without having to know code, a WordPress backed CMS with Buddypress integration. Users can now set up profiles for themselves, private message each other, post status updates and easily sign up, compete and submit entries. One of the best parts of this project is seeing the Gauntlet in full swing every autumn. If you’re into writing or like reading speculative fiction, I highly recommend checking it out.